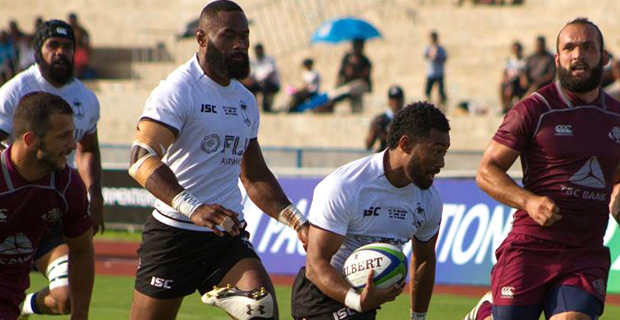 Fiji Airways Flying Fijians centre Semi Radradra and halfback Henry Seniloli have been named in the round two June test team of the week by Planet Rugby. Ireland have the most representatives with four players but there is a relatively even spread after South Africa, USA, Fiji, Italy and Wales all picked up fine victories. Having just been involved with the Fiji 7s side, Radradra looks fitter, stronger and more terrifying to defend against every time he plays. He broke the line with ease on Saturday against Georgia, creating Henry Seniloli’s try and then deservedly getting on the try column himself in the 83rd minute. Coach John McKee says he was really impressed with Radradra and Jale Vatubua. Seniloli topped the no. 9 work rate last week, who showed a poacher’s instinct for the first try, before he combined well with Radradra to score a second as Fiji claimed their fourth consecutive Pacific Nations Cup. The Flying Fijians will take on Tonga at 3pm Saturday at Churchill Park, Lautoka and you can catch the live commentary on Viti FM. 15 Rob Kearney (Ireland), 14 Josh Adams (Wales), 13 Semi Radradra (Fiji), 12 Damian de Allende (South Africa), 11 Matteo Minozzi (Italy), 10 AJ MacGinty (USA), 9 Henry Seniloli (Fiji), 8 Duane Vermeulen (South Africa),7. Jake Polledri (Italy), 6. Peter O’Mahony (Ireland), 5. James Ryan (Ireland), 4. Guido Petti (Argentina), 3. Tadhg Furlong (Ireland), 2. Joe Taufete’e (USA), 1. Steven Kitshoff (South Africa).